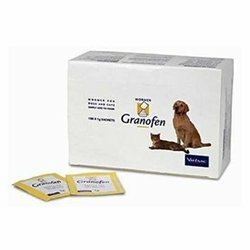 Granofen Wormer granules for dogs and cats is a broad spectrum wormer for treatment of dogs and cats infected with gastrointestinal worms. 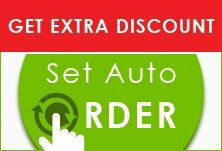 This helps to kill and eliminate the all the various types of roundworms, lungworms and breeds of tapeworms. It is highly effective and safe to use on your pet. It is supplied in 1, 2 and 4g sachets which contains flavorless granules to be added to food. These sachets come in different sizes of animals. Treatment can be repeated when natural reinfection with parasitic worms occur. Routine treatment of adult animals with minimal exposure to infection is advisable 2 to 4 times per year. More frequent treatment, at 6 to 8 weekly intervals is advisable for dogs in kennels. Granofen worming granules is ready to administer oral anthelmintic for dogs and cats. Each 1g of Granofen wormer contains 0.22g of fenbendazole. This helps to kill all types of gastrointestinal worms in puppies, dogs, kittens and cats. It controls and prevents from the infestation in your pet. Adding the granules to the small tasty treat will encourage the pets to take Granofen with ease. The sachets come in different range of grams according to the size of the animal. I am not sure if it is helping my dog yet, but she does seem to have a little bit more energy than she used to. She doesn't mind the taste so I will continue giving it to her.